In order for the Cloud Service to work and for evidence and data to be saved centrally and shareable between your devices, it is ESSENTIAL that all of your devices are using Cloud System Data. 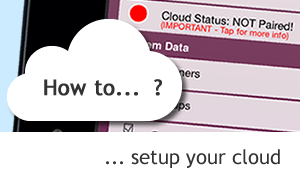 Cloud System Data can be accessed via Settings (Device Admin)>Cloud Admin under ‘System Data in the Cloud’. Each device does not need to have the complete set of Cloud System Data, you can choose the System Data you need, but NO device should have any System Data that DOESN’T live in the Cloud. What’s more, with EfL version 4.0 we have introduced a useful and very powerful synchronisation engine that sends the evidence data captured on multiple devices across a setting, to the learner’s Cloud profile (when connected to the Internet). It will also keep your System Data (Learners, Groups, Frameworks, Date Ranges, Tags and Comment Templates) up-to-date and synchronised across all your devices, and we have made it easier to save your PDF reports (document and grids) to each Learner’s Cloud profile too. Once you have your devices setup, your evidence and System Data will synchronise in the background automatically – all you need is an Internet connection. Pair each device with your Cloud. You add learners and other System Data to the Cloud by first adding them to your device and then by following the pairing process (‘Pair this device’). This pairing process lets you add to your System Data in the Cloud and pair System Data on your device with existing System Data in the Cloud. In many cases though you will have some data already on one or more than one device either from a trial or previous ‘Standalone Subscription’. In this case you can upload the data to Cloud on a device-by-device basis as you pair each device. If you have the same learner on more than one device, you can “pair” this learner with the data record already in the Cloud following the simple steps in the “Pair this Device” wizard. NB. If you are following this second route, you may need to check that all the necessary learners are catered for on the existing data, if not then add any additional learners to one of the devices. In order for a device to know to which learner’s cloud profile your evidence should be saved during the sync process, the device and the Cloud need to be working with the same learner data (System Data). The same is true for the frameworks, tags and other System Data. For example, if when capturing evidence on your device, you have marked some outcomes from a framework you are using, the Cloud will need to ‘know’ that same framework in order to save the evidence and updates in the learner’s Cloud profile. We call the process of marrying the device and cloud ‘pairing‘. Sometimes you’ll be pairing a device that has never been used for EfL and sometimes you’ll be pairing a device that has some System Data (and possibly even some evidence) on it already. If it’s the latter you will need to map each learner or framework etc to the corresponding existing version in your Cloud. If it’s not in the Cloud you can add it to the Cloud and if you don’t need it at all, you can delete it from the device (subject to whether you have evidence that links to the learner, framework or tag). To help you through this process, we’ve added a step by step assistant which can be initiated by tapping ‘Pair this Device‘ from the Cloud Admin menu. Once your devices have the latest version and the device has been paired with your Cloud you’re good to go. All your existing evidence and any new evidence will begin to sync with the learners’ Cloud profiles automatically. The sync engine will work in batches of 50 at a time, so if you have a lot of evidence on your device that you want sync’ing to the Cloud it may take several cycles to get it all there. If you need to nudge it along you can tap the Sync Status in the Device Admin menu. To see at a glance the current sync status for the device you can tap on the Settings button in the top left of the home screen to bring up the Device Admin menu. here is the ‘Paired but not all evidence has been saved to the Cloud’ message. and here is the ‘Paired and everything is sync’d’ message. To see an overview of your devices you can open the Cloud Admin and choose Device Manager. The Device Manager will show you the last known status for each device. That is the status as at the last time the device connected to the Cloud. If the device has been working offline the device manager won’t be fully up to date. Device: This will describe the device type i.e. iPad Mini 3 (WiFi). Device ID: This refers to the DeviceID part of the licence code, useful for checking which licence code was used to activate device. Version: Version of Evidence for Learning running on the device. Role: This will display the Role the device is set to (Educator or Administrator). Paired: Whether the device is paired or not. Devices not paired will not be able to sync with your Cloud. Evidence not saved in Cloud: This is the count of published evidence not yet saved to the Cloud, draft evidence is not included in this number. Last Seen: The date this device last successfully sync’d with the cloud. Here’s an example in which we can see a device isn’t paired and there are 75 evidence records building up on the device that haven’t been sync’d. How to add new System Data? Ok, so now your devices are synchronised with your Cloud how do you add more learners, or perhaps you want to start tracking a new framework or even add a new Date Range. The Cloud Admin is responsible for the data in the Cloud and is the only person who can add new System Data. You’ll need to open the Cloud Admin menu and switch to Administrator role. Then we need to add the learner or the framework to the device from the Device Menu. When you are finished adding System Data return to the Cloud Admin Menu, switch back to Educator role. EfL recognises you have added new System Data and that the device is no longer married to the Cloud so we need to ‘Pair this Device’ again. During the pair process your new System Data will be uploaded to the cloud. Your Cloud Admin password is the key to your data, as with any password system you should keep the password safe and secret. We recommend that you share with as few people as possible on a ‘need-to-know’ basis and it’s good practice to change the password for your Cloud Admin. Tutorial: If you have a Cloud Subscription, setting up your system data and pairing your devices is an important step towards cloud synchronisation.